We have watched Future Food on the Planet Green Television Channel. It depicts Chefs Omar Cantu and Ben Roche attempting the save the world by finding inventive ways to recycle food. The show is ridiculous. Aside from questioning whether it’s even reasonable to try to reuse prepared food (over and above reheating your leftovers), the energy cost of processing food is anything but green. Green or not, the show does teach some pretty cool ways to cook using liquid nitrogen, centrifuges, high frequency agitators, and a variety of chemicals used to change the consistency of everyday ingredients. 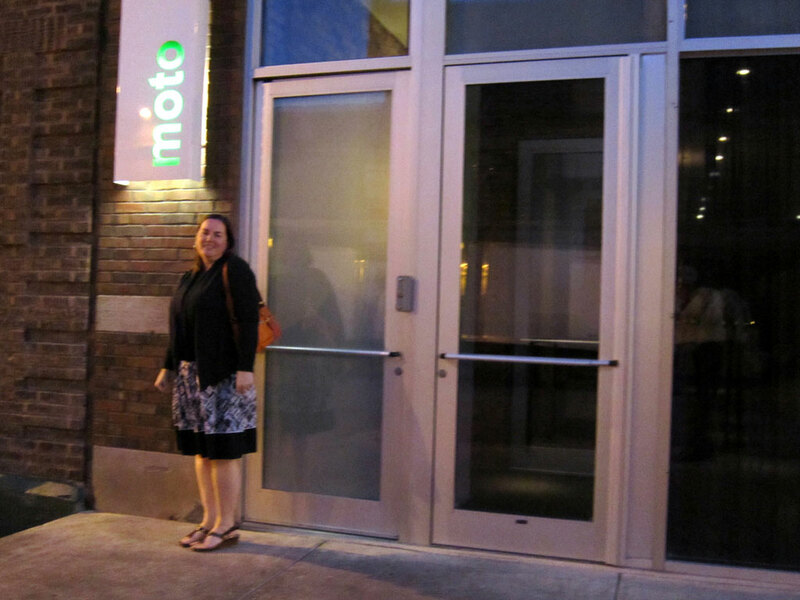 Moto is the restaurant in Chicago where all of this takes place. While the show is sometimes silly, the restaurant serves highly acclaimed food (or at least highly debated food) and looked like a fun place to go. Plus, we had already eaten at WD-50 where similar cooking techniques are used, so a comparison seemed worthwhile. The taxi drivers in Chicago are great. This is important to know, because when arrive at Moto’s address the middle of the meat packing district – at night – you might question if you are in the right place. You are. Tucked in with the warehouses and loading docks is a very unassuming doorway. The fact that there is sign next to the door lends little comfort. The building is dark and it took the valet standing on the street to usher us inside. Inside it remains dark. 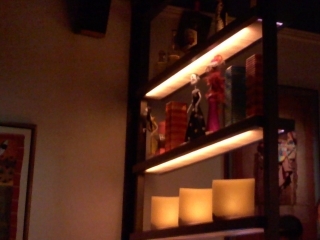 The room is dimly lit and starkly decorated in ultra modern fashion. The host greets us warmly and we are seated right away. The first thing that comes to mind is that there is no bar. There must be one somewhere, but the room doesn’t look anything like on TV. Our conclusion is that there is a separate doorway to another part of the restaurant. 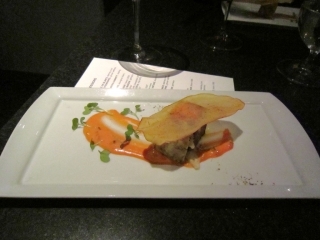 Two tasting menus are offered: a 10 course and a 20 course. We had selected the 10 course when the reservation was made, so we were immediately given the edible list of things we would be dining on. Yes, the menu is meant to be eaten. 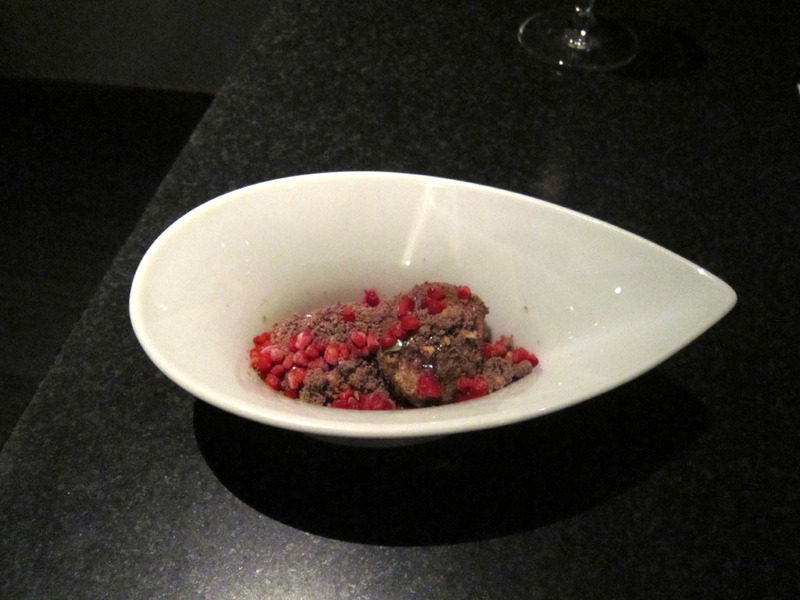 This is a good start to a dinner that promises to be weird and inventive. Is the menu tasty, you ask? 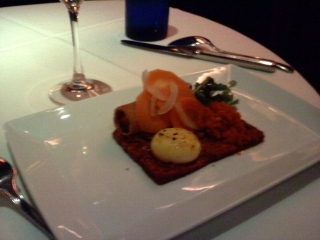 Well, it’s a cracker, but the spinach purée was a good accompaniment. 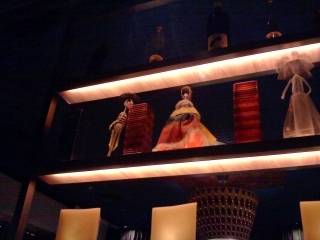 The evening is a bit of a blur; although, there were memorable high points. 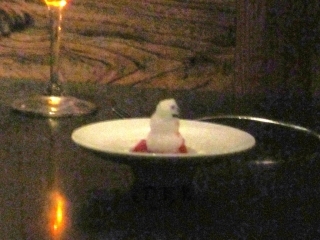 The Snow Man is presented in a bowl atop a pile of raw tuna. The snow man is made of lime foam and has a face drawn on with black sea salt. 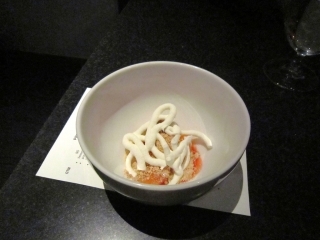 The server then pours a Margarita-like liquid over the snow man, melting it like the Frosty the Snowman, and forms a kind of instant ceviche with the tuna. 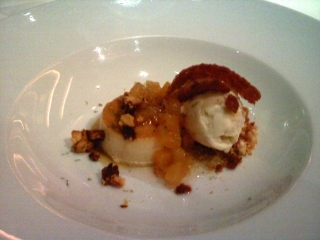 Really tasty and Ruth’s favorite course. 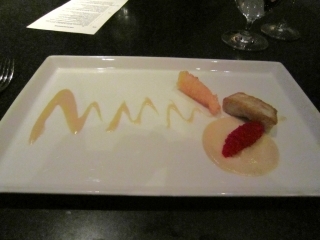 The White Steel was interesting combination of escolar with grapefruit as a different kind of acid to serve with the fish. 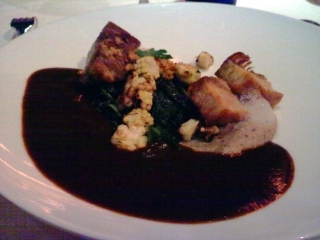 The Maitake and Pork Belly was really good, but when is pork belly not good? Things started to get more creative with the Quail and Cracker Jack with combined flavors of peanuts, popcorn, caramel – and quail. A definite winner that included more soy ink printing. The Rabbit Maki was a clever presentation of sushi that is not sushi, also very good. The Reuben Lasagna was good, but a but obvious. 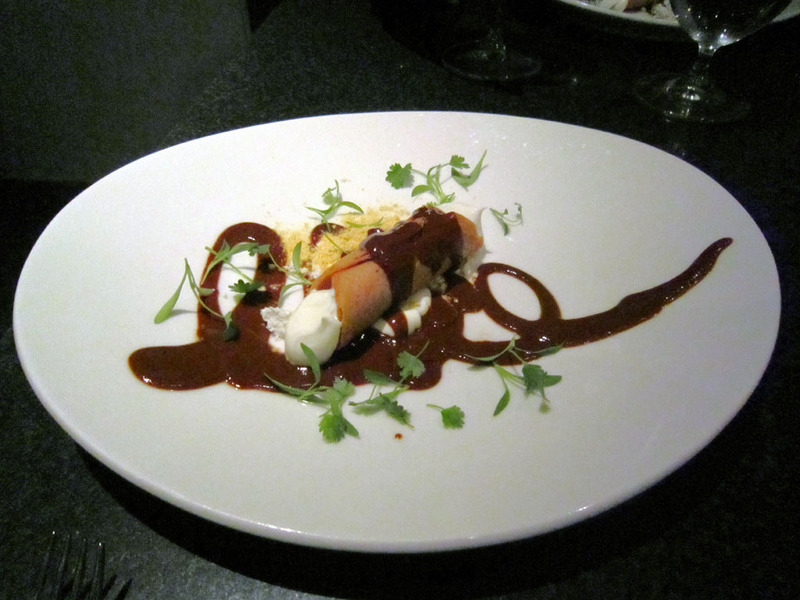 The Mexican Cannoli might have been good, but since we had just eaten at Topolobampo, we deemed the molé sauce to be very much sub-standard. 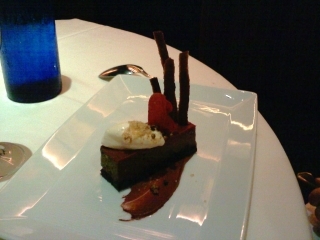 The desserts were a little disappointing. 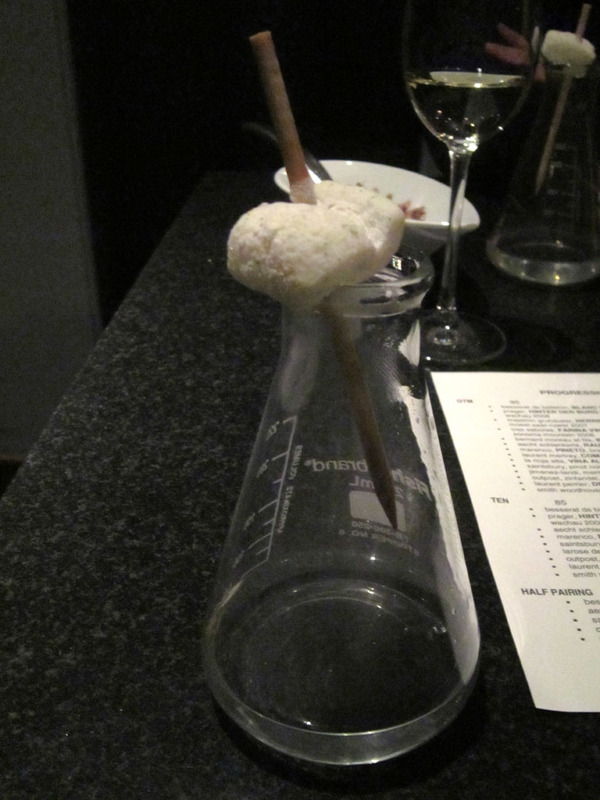 Given the technical nature of dessert making in general, we though this is where Moto would excel. We found the desserts to be overly simplistic. 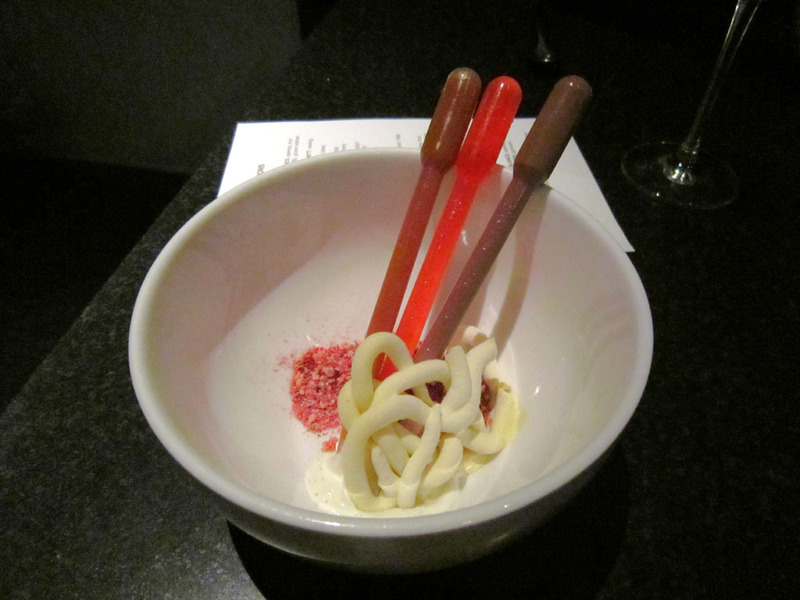 The Frozen Yogurt was an interesting presentation with the yogurt frozen in a big squiggle, but not amazing in flavor. The Chamomile and Pineapple was an unfortunate flavor combination that we just didn’t enjoy. The Banana Split was a fun dish, allowing us to squirt the ice cream with chocolate, cherry, and caramel sauce from individual pipettes. 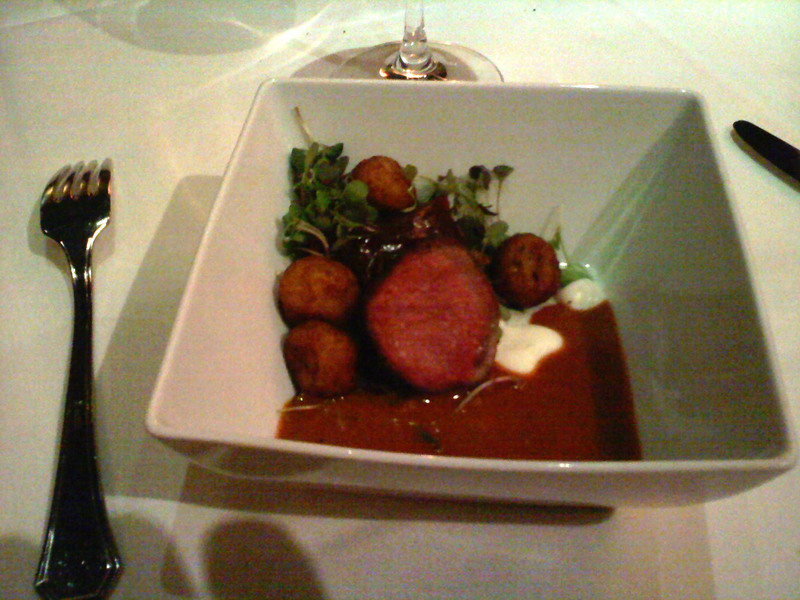 The flavors we exactly as expected, which was a bit of a let down. The Tuber Melanosporum is a cute way of saying truffle, in this case chocolate. We can no longer remember what accompanied it. We excitedly awaited the packing peanut. The edible packing peanut was featured on the TV show as a food/packing material. We had seen other tables receive them an we saw that they were served atop a beaker containing super chilled liquid that caused people to blow vapor from their mouths. Ours was delivered while we were still eating the truffles and it warmed up before we could drink it. Bummer. Regarding the service: it wasn’t great. At this price point, we expect perfection and it wasn’t. Courses didn’t come out very consistently. The restaurant wasn’t overly busy, but the waitstaff seemed distracted at times. When the people next to us got their snow man waiter forget to melt it. We had to waive them off from eating the tuna pre-ceviche. The bathrooms were unexpectedly plain. We have a picture of the flushless urinal, but when not in use, it just looks like a urinal, so no picture posted. 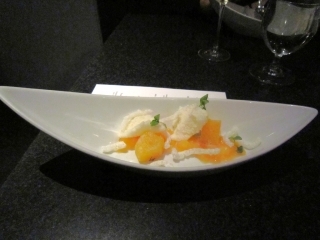 Posted in Restaurants, Vacation and tagged tasting menu on October 9, 2010 by Doug. When Doug was about 5 years old, his parents took him to a Mexican restaurant in California. It was the family’s first trip to California and Mexican was unknown and exotic to Massachusetts residents. To this day, he and his mother argue the reasons given for which Doug threatened to eat a napkin rather than eat the food. His mom claims it was because he lacked an appreciation for Mexican cuisine. Doug claims the restaurant simply wasn’t up to his standards. A life-long quest to find good Mexican food had started. In the early days, finding a Taco Bell was even considered a special treat. 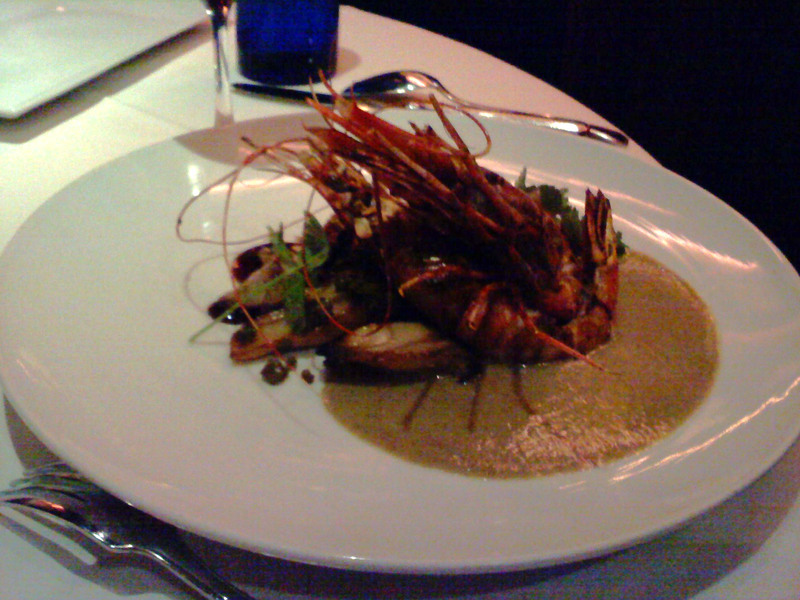 Later years turned business trips to San Antonio and San Diego into (expensed) food quests. 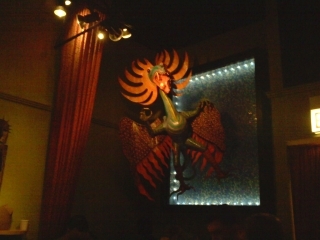 Cookbooks were purchased, including Diana Kennedy’s My Mexico, and lead to the discovery of Rick Bayless and his opening of the restaurant Frontera Grill in Chicago. 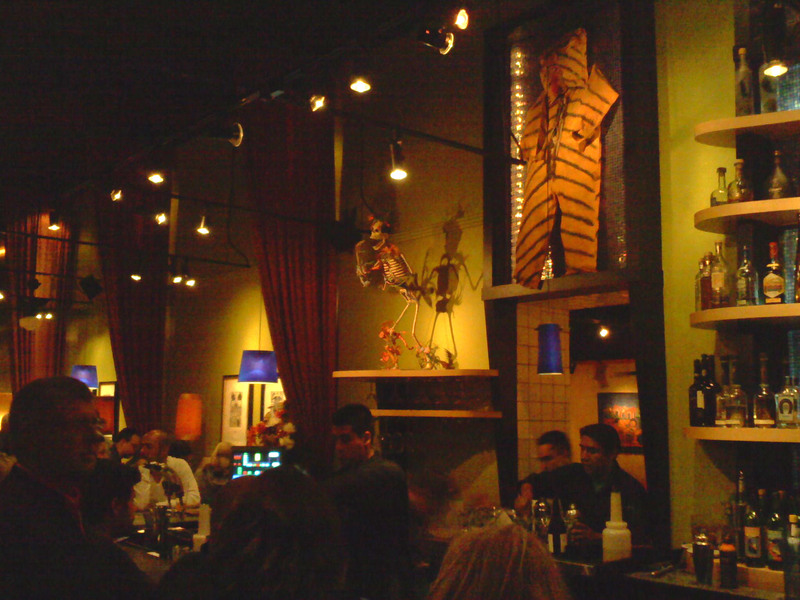 When we decided to vacation in Chicago, Frontera Grill was immediately put on the list as a dining possibility. 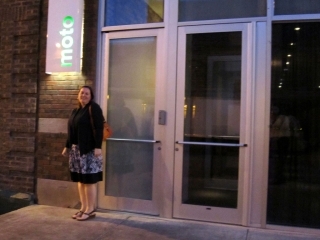 Given our schedule and limited dining opportunities, we decided to eat at Topoplobambo, Chef Bayless’ more upscale restaurant, because they took reservations where Frontera Grill does not. 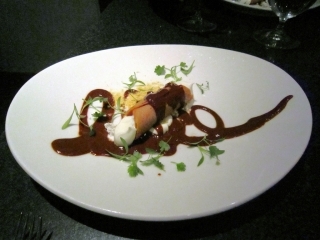 The first thing you need to understand is that Topolobampo and Frontera Grill are essentially the same restaurant. They are in the same building and share the same kitchen. Frontera serves as the bar for Topolobampo. Locals probably found us amusing to watch as we searched in vain for a separate entrance. The bar is lively. Upon ordering Margaritas we discovered that they are made one at a time with fresh squeezed juice. They are incredibly tasty. The only negative is that they are small compared to the vat o’ Margarita we have become used to receiving. We were then brought to the other side of the wall – the Topolobampo side. Here the noise is reduced, but only a little. 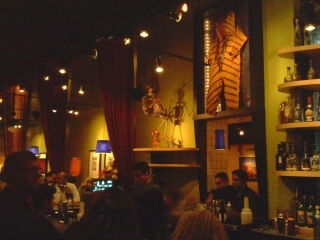 The tablecloths are white, but the artwork and Day of the Dead figures maintain a festive atmosphere. The room is full, but uncluttered. 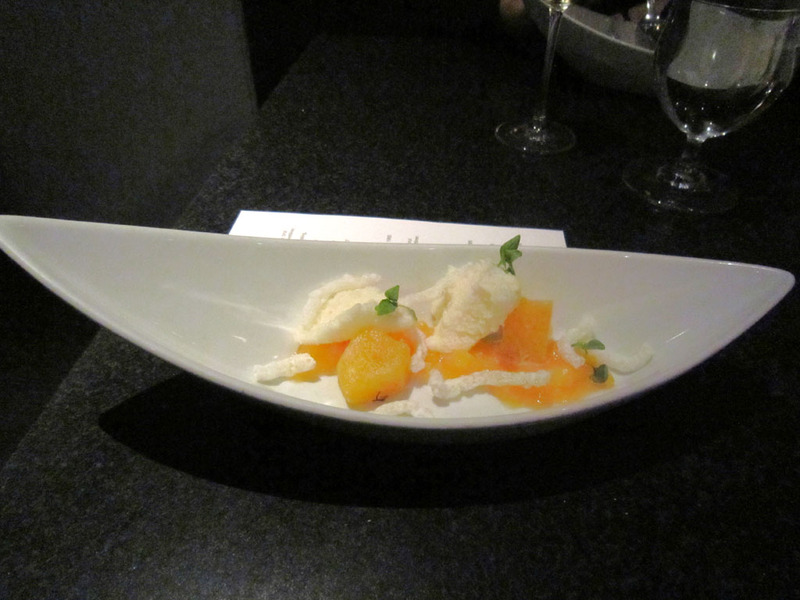 We receive menus and discover that there are three different five-course tasting menus. All three looked good and we were amused to learn that they were listed in order of adventuresome-ness. 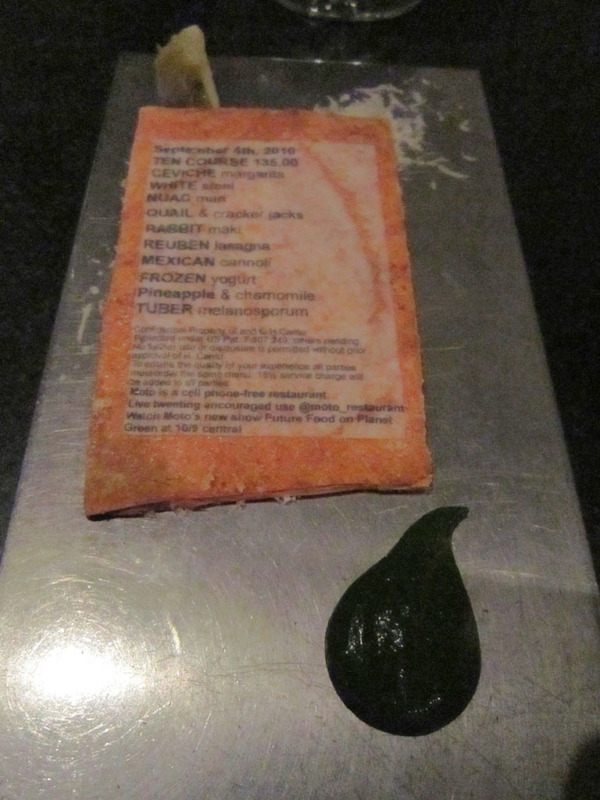 The third utilized ingredients only found in Mexico or contained food prepared in ways that some people don’t like, such as leaving it raw. 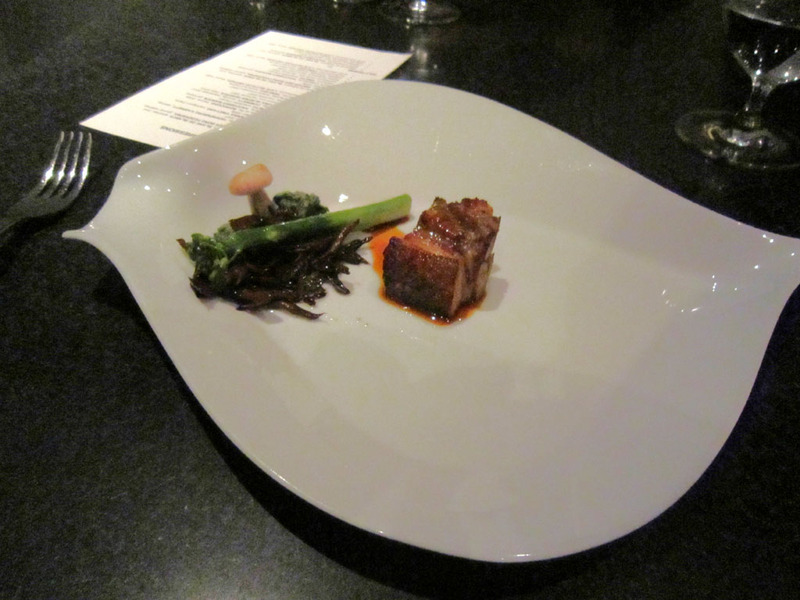 It also had had some of the cooler ingredients like candied sweetbreads and crispy pig’s ear. Clearly we were not going to pass on anything with crispy pig’s ear, but as it turns out we could each order a different menu. We went with the last two being the adventuresome types that we are; thus, allowing us to try 10 differnent dishes. 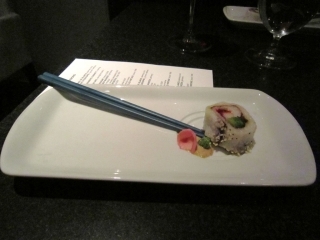 You may notice that there are only eight pictures of food. As has happened in the past, we went in without planning on writing about the experience then quickly changed our minds. The food was phenomenal! 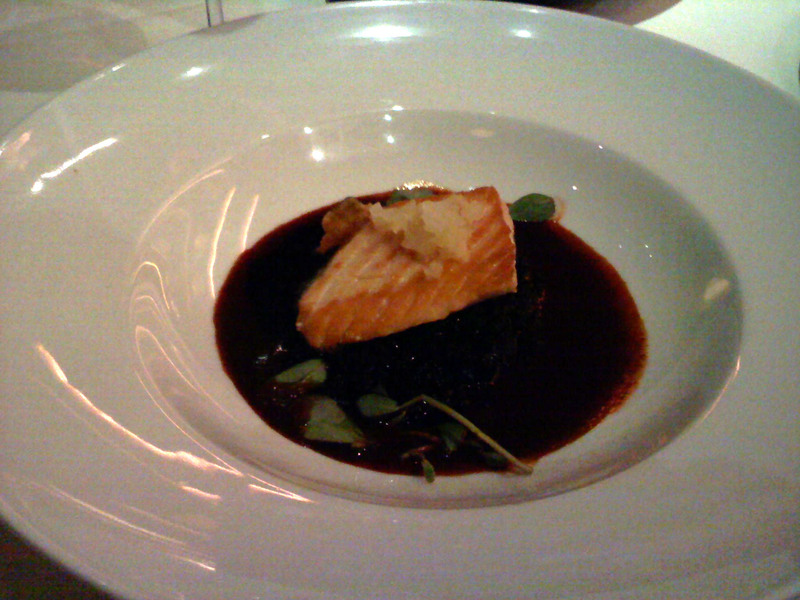 The flavors of the rich, complex sauces and the earthy garnishes were better-than-hoped-for complements to perfectly cooked meat and fish. 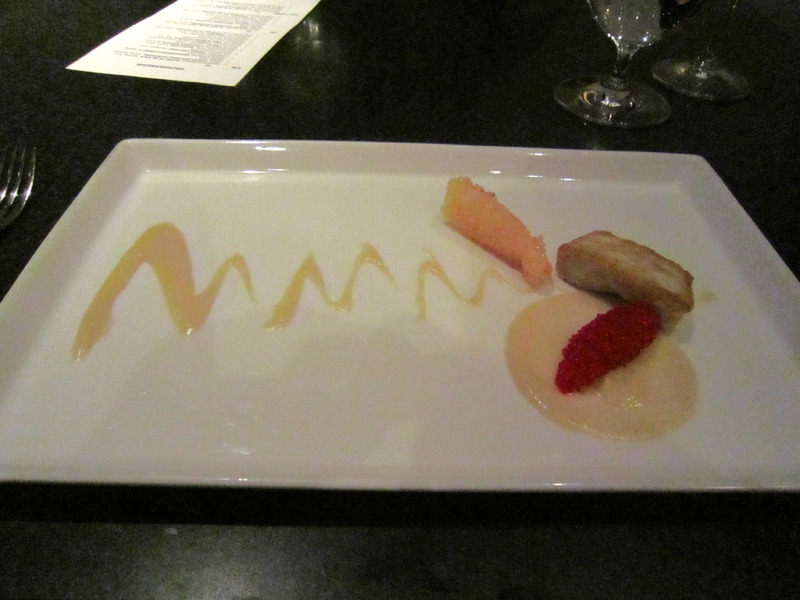 The plates were beautifully arranged and had a substantial amount of food with each course since the tasting menu was limited to five items. We had only one issue with the rib-eye tartar that came out icy cold, but even this proved to be a really strong dish after we left it to warm up. We wished we had taken pictures of the first courses that included oysters that even Ruth (who is not a fan) liked. Unfortunately, the restaurant doesn’t seem to take the service as seriously. Not that it was bad, but just not great and seemed to be in contrast with the meticulously created food. 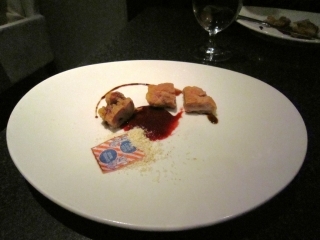 On the other hand, this tasting menu might be the best deal for the money of any place we’ve eaten. Given that Doug was much more gleeful about the meal than Ruth, one might make the argument that this was a really good meal – for Mexican food. The flavors are unique and not necessarily to everyone’s liking. When considering the price point, it comes to mind that some cuisines (like Japanese) seem to get away with being nominally more expensive than average, Mexican does not. 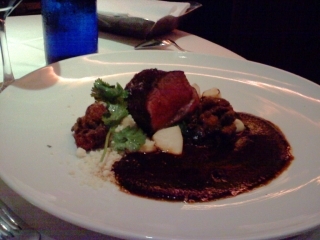 We very much recommend Topolobampo and assume that Frontera Grill would be very good also. Arrive early and enjoy the bar. Sorry, no pictures of the bathrooms. Posted in Restaurants, Vacation and tagged tasting menu on October 8, 2010 by Doug. A quick jaunt through Chicago – mostly walking, but boats and cabs employed when pressed for time. Good food and sight seeing over 72 hours and capped with a Crowded House concert at the House of Blues. Posted in Music, Vacation on October 8, 2010 by Doug.